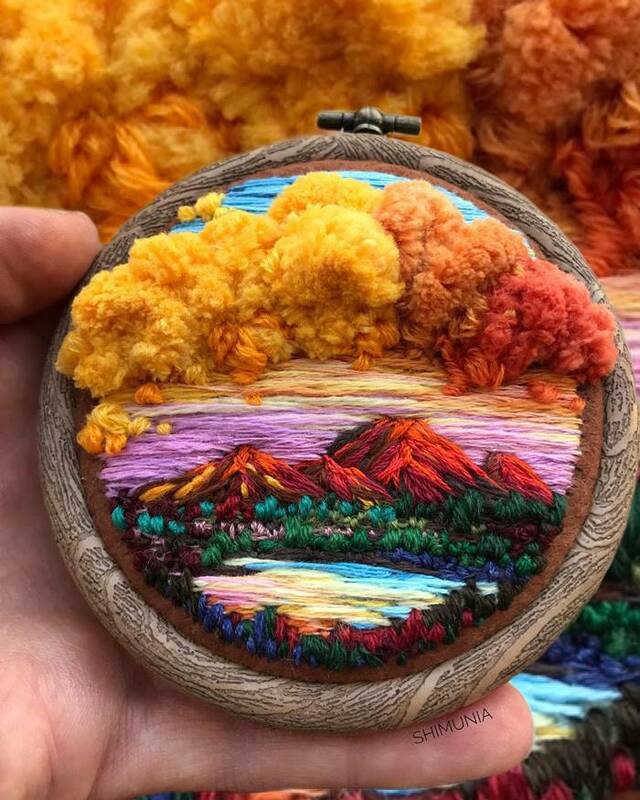 Embroidery is an amazing art that requires special attention, scrupulousness, perseverance and special skills. 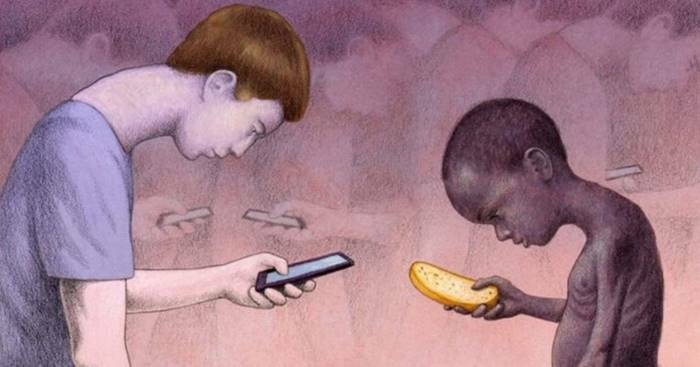 After all, it is thanks to them that the real masterpieces are born, from which the eye does not take your eyes off. 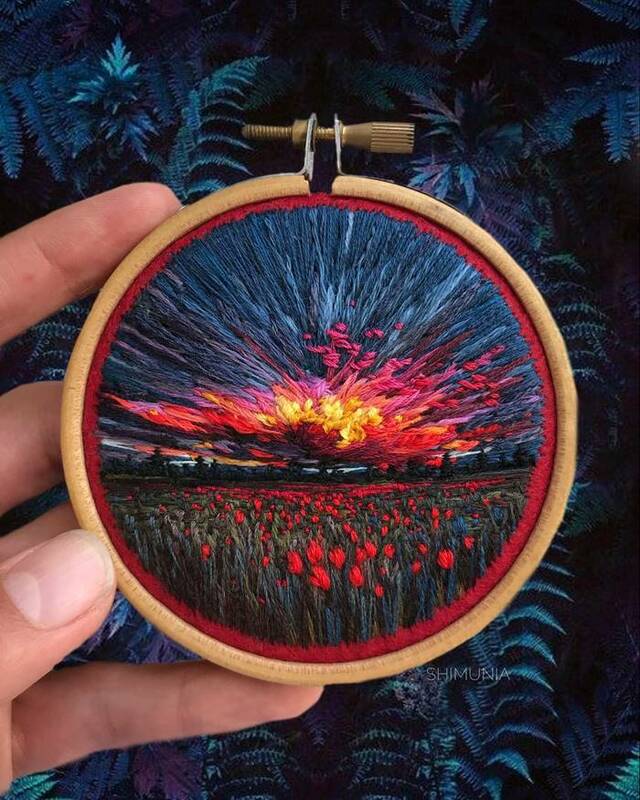 Someone creates an incredibly large-scale amazingly beautiful pictures, embroidered with a cross, and someone modestly embroiders with a satin stitch, inventing at least original works that are in demand. 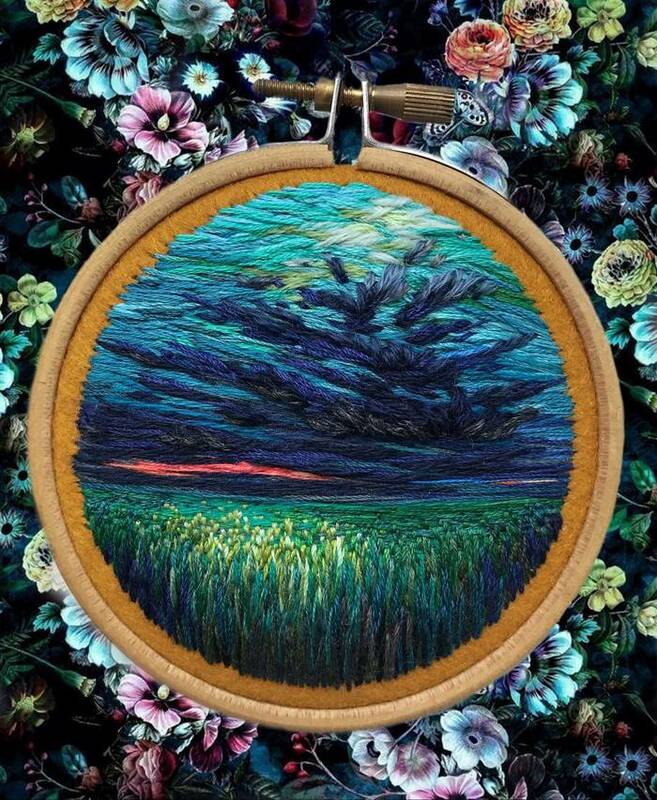 The Russian craftswoman, known under the pseudonym Vera Shimunia, “writes” with the help of threads and needles stunningly picturesque landscapes, striking in their realism, as well as a riot of colors and colors. Over time, many artists began to improve their embroidery technique, thus opening the veil of the sacrament in front of the audience. 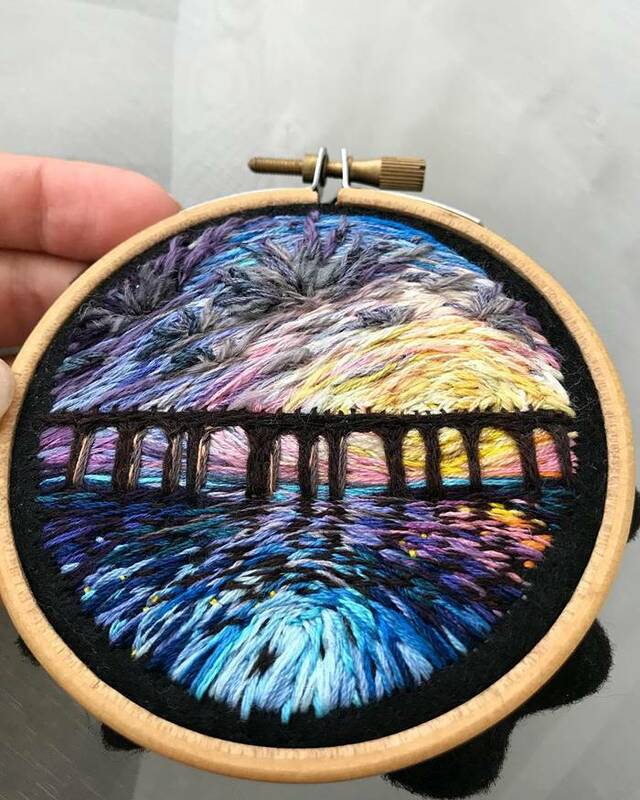 Of course, today there are still many adherents of the classics that use the methods of working with simple and clear lines that have been used for years, but there are also masters who use threads to create something unique and completely new, combining colors, different textures and much another. 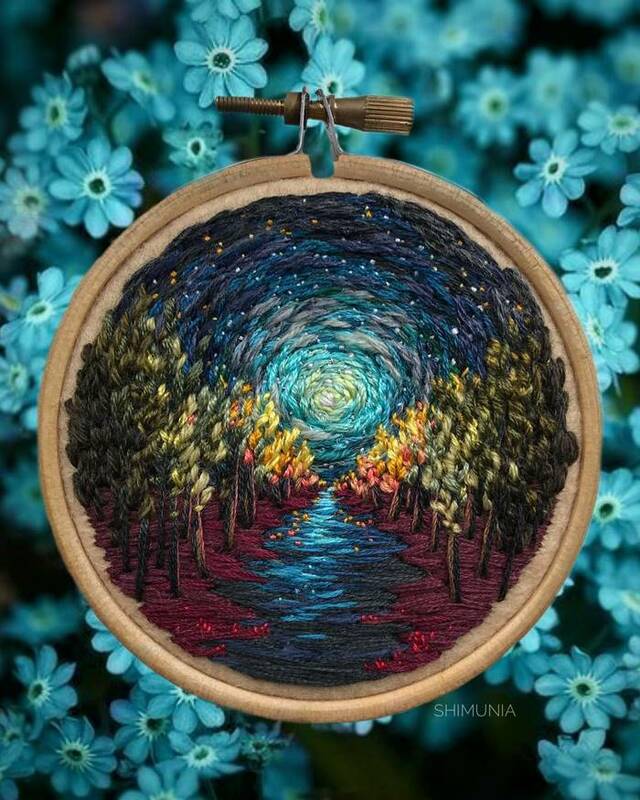 One of those who improved the hybrid craft with embroidery was the Russian artist Vera Shimunia. 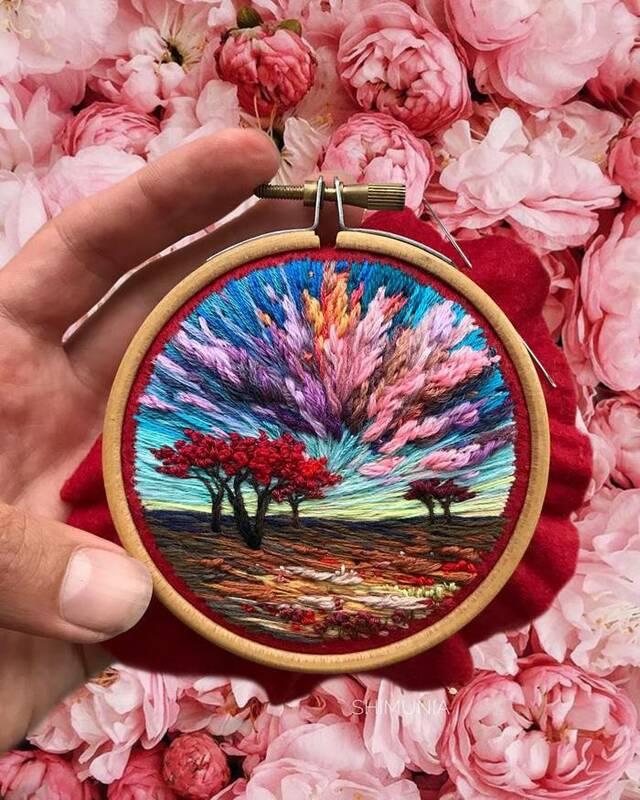 Her pictorial embroidery patterns are works of landscape art, skillfully sewn and embroidered with multi-colored threads. 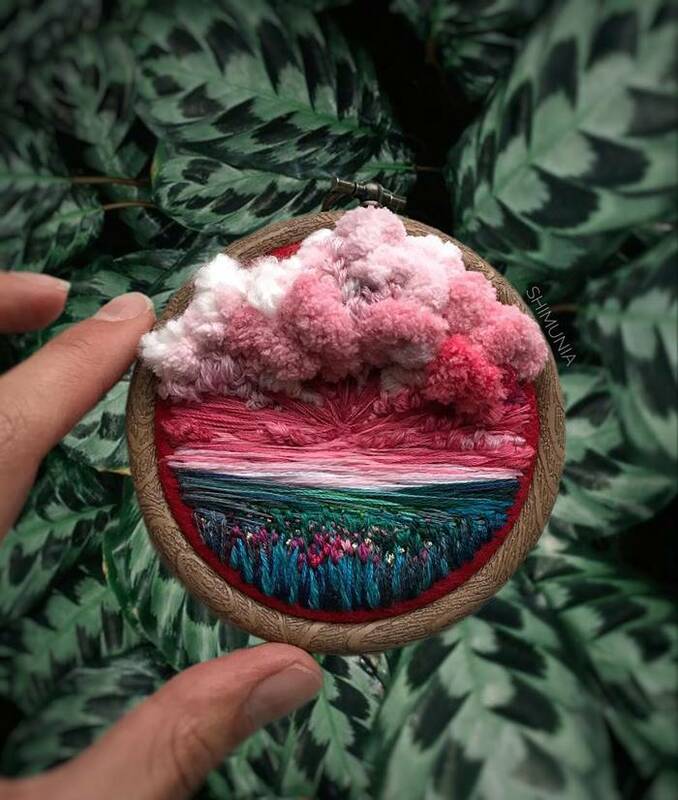 Vera began her practice of landscape embroidery in 2015. 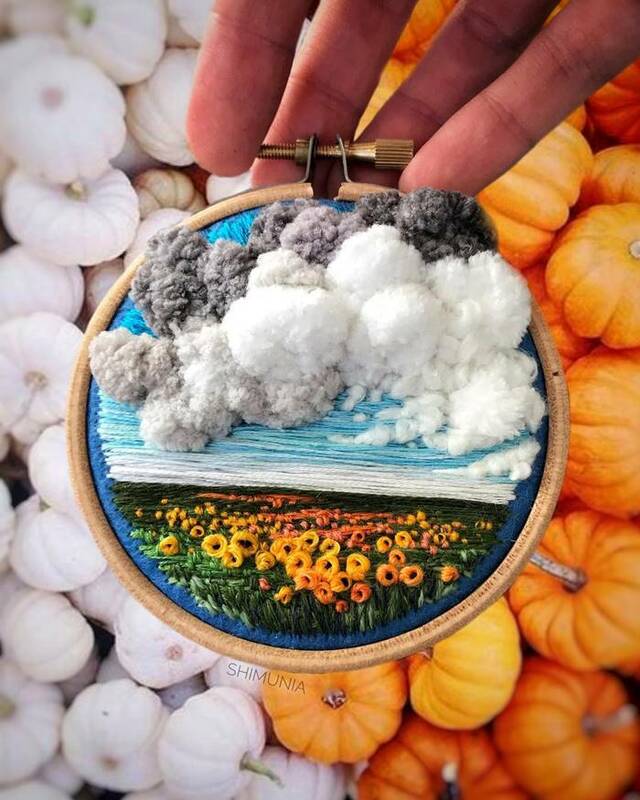 According to the author, miniature embroidery is an ideal environment for her, because she is not as demanding as cross-stitch, and more exciting than traditional painting. 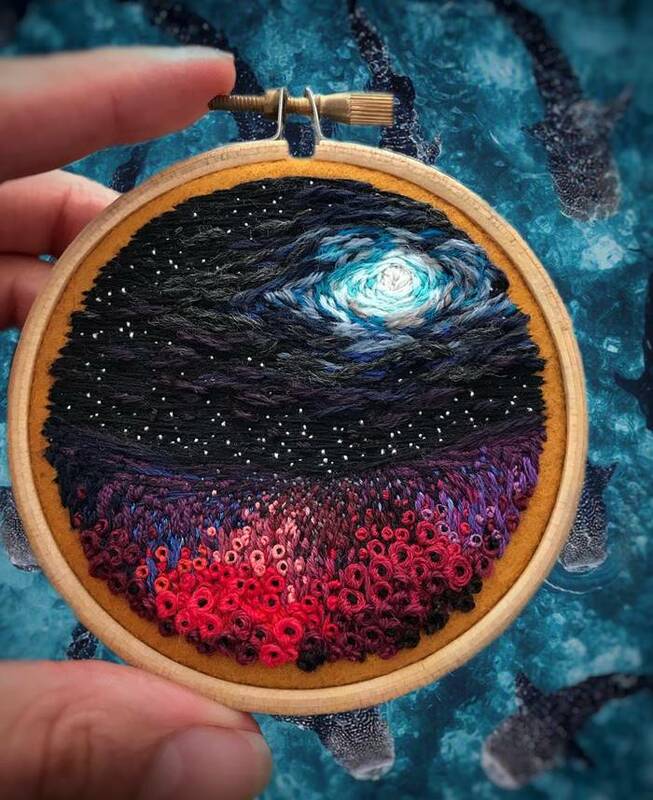 The most interesting thing is that the artist from St. Petersburg is self-taught (in college, she studied economics and had nothing to do with embroidery), but you can't tell by her excellent work. 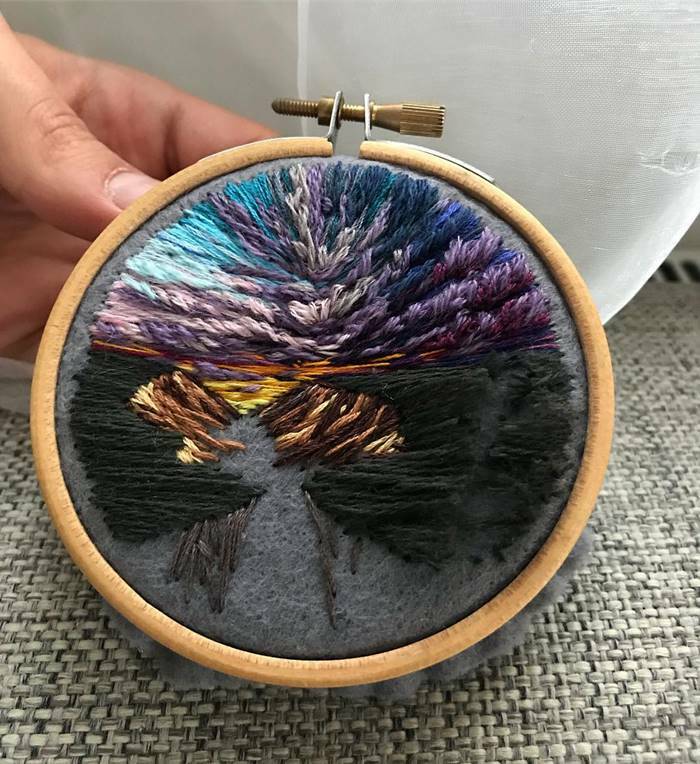 Mountain ranges, rivers, sunrises, sunsets, voluminous clouds, sometimes fluffy and light, like cotton candy melting on the tongue, and sometimes heavy, like thunderstorms hanging over the city, threatening to erupt in torrential rain, immense landscape expanses and sprawling tree crowns. 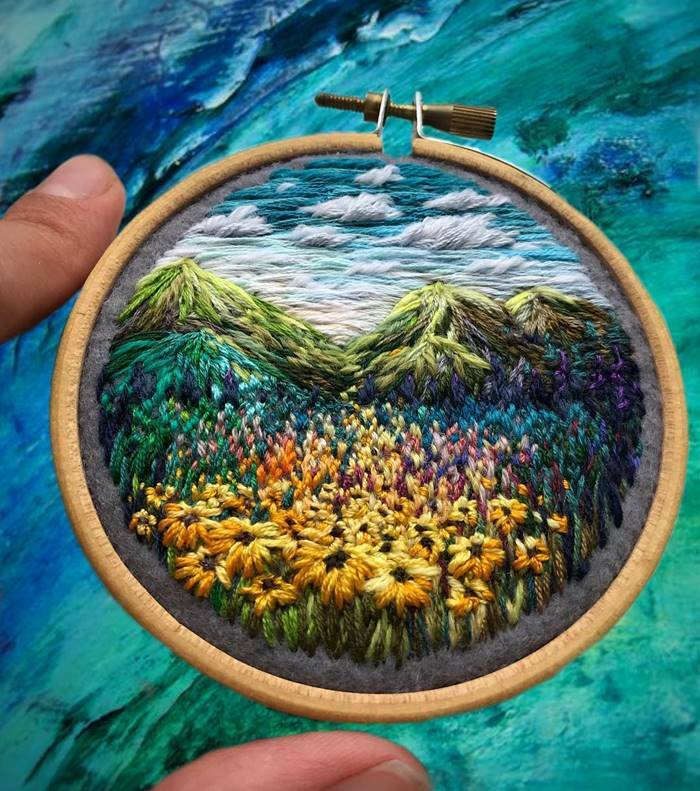 Just imagine how hard work you have to invest in each such miniature, looking at which, you are amazed at the detail and relief of the landscape. 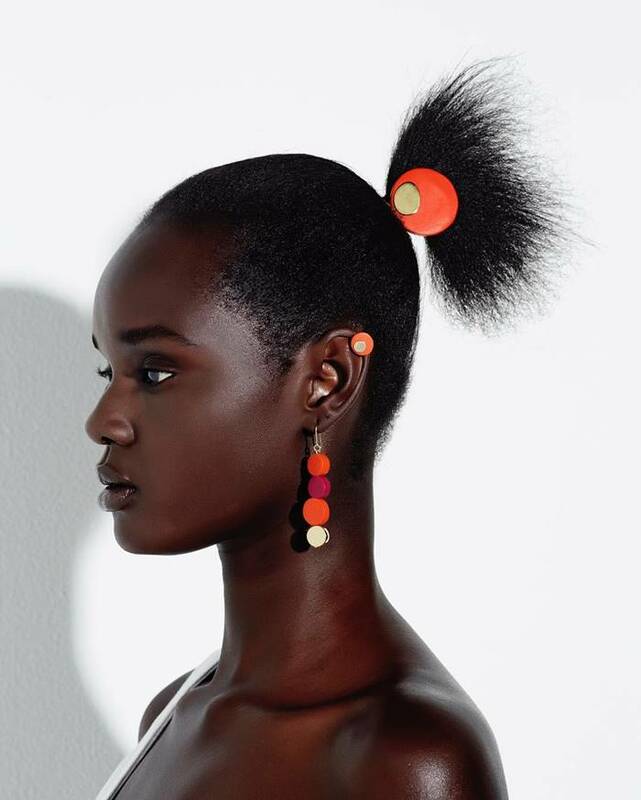 Despite the fact that Shimunia uses a single color palette in a small area, this does not in the least prevent her from creating truly spectacular three-dimensional images that do not merge with the background and among themselves. 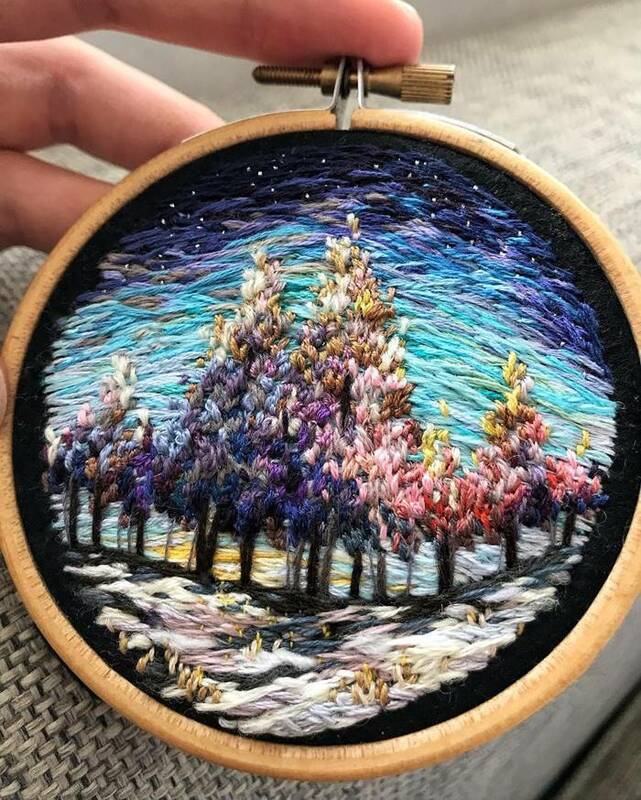 The whole secret of her work lies in the technique itself, where different weaving, stitches, knots, as well as thin, thick and three-dimensional fibers are used, which help to create that same inimitable realistic effect. 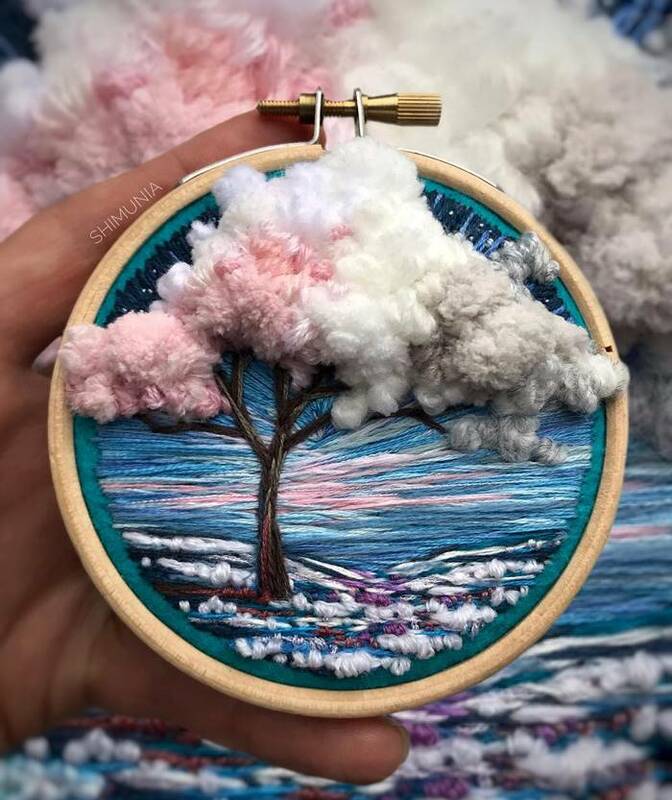 With the help of various stitches and styles, Faith manages to capture nature as it is. 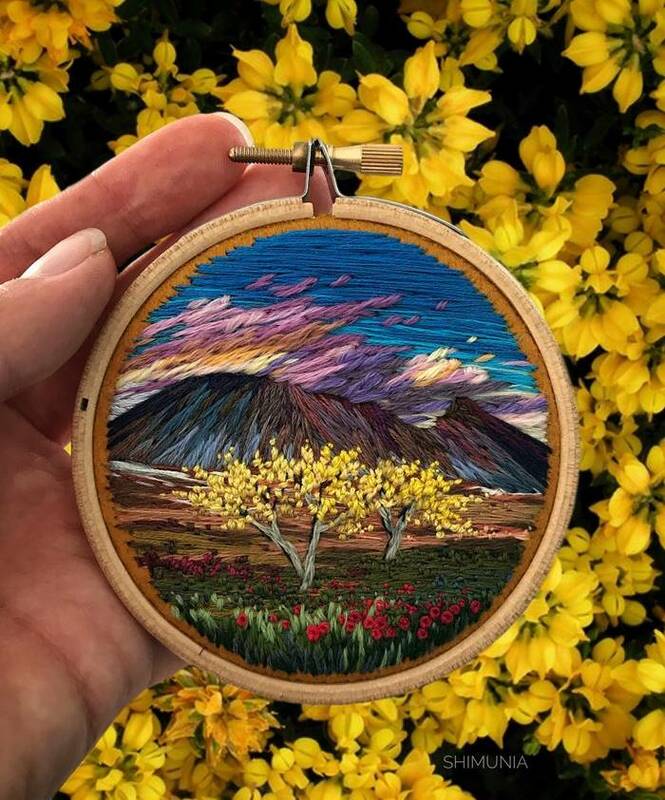 Natural motifs, buds of various colors, whether delicate and fragile daisy or other bright heads, are made by French knots, crowning the beauty of meadows and steppes, and the shades of mountain peaks and seas are interconnected like thick, oil paints. But Vera received the greatest popularity due to her paintings, which depict the heavenly slopes. Regardless of what is depicted in the picture, calm sky or thunderstorm, heavy clouds penetrated by rare rays of the sun, Simon always complements them with various textural solutions that only brighten the work. Red, foreshadowing frost and winds, orange and yellow, like liquid gold, sunsets spread, announcing the end of the day. 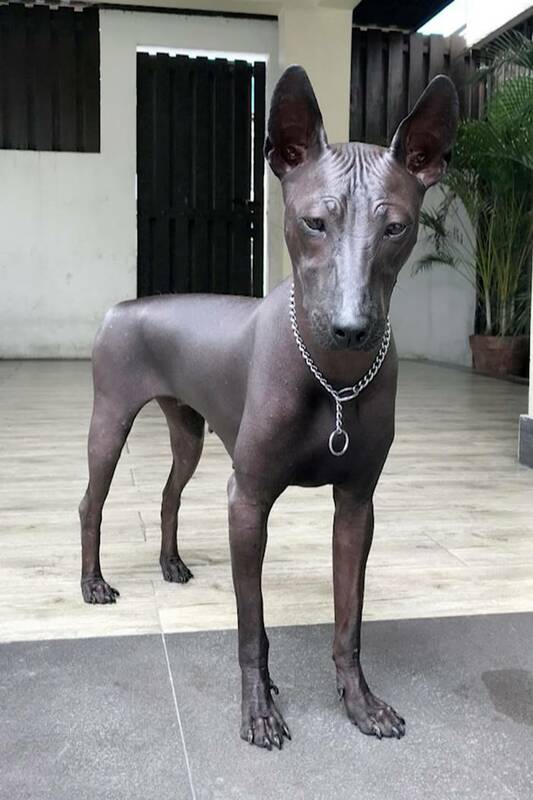 And this is only a little of what attracts attention, because if you delve into studying and viewing the artist's works, you can spend several hours doing this occupation, intently studying the smallest details and beauty of the surrounding world, which fit a little more than ten centimeters. Autumn, maddening abundance of yellow, orange, red, purple colors, pleasing the eye in inclement weather. 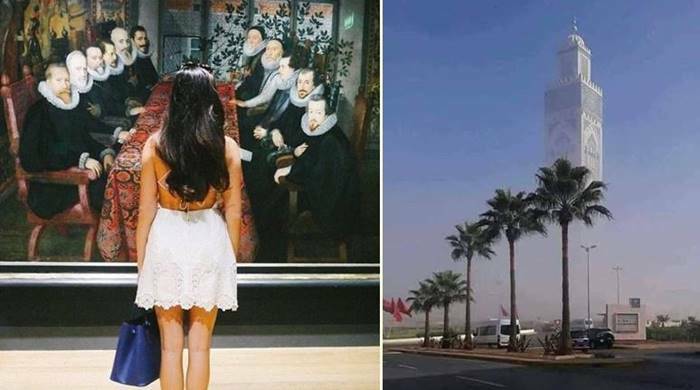 White-pink trees, whose crowns are like whipped cream and cute lambs that you want to touch so hard to make sure that everything is real and not an illusion created by some new-fashioned graphic program. 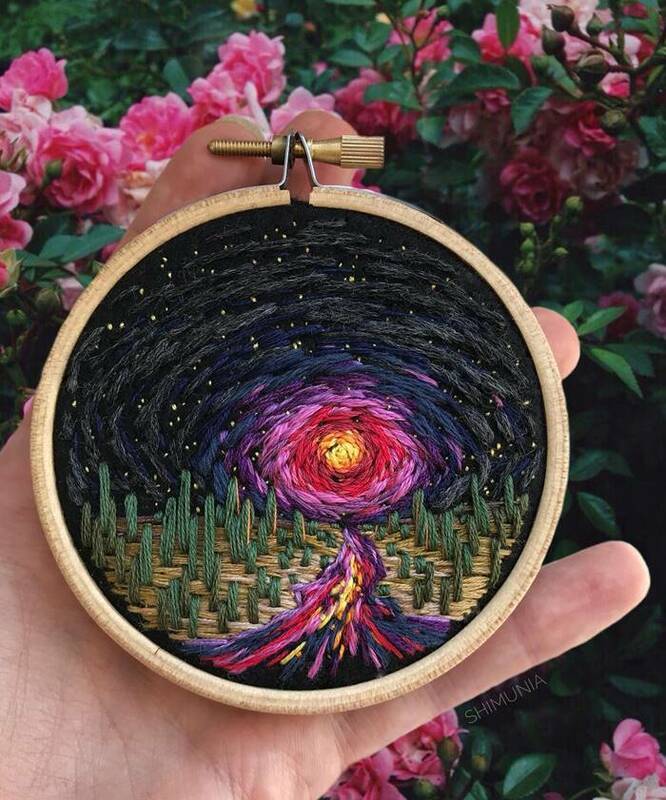 Despite the fact that the pictures of the author are already small, it does not stop at what has been accomplished and also skillfully and professionally creates embroidery that does not exceed the size of a human finger’s pad. 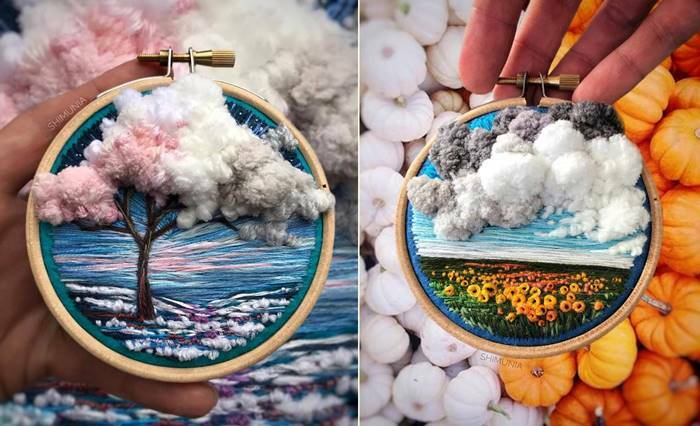 She also diligently develops her own style and craftsmanship, thanks to which unique combinations of embroidery with a photo appear, which form an unimaginable combination of a photographic background and embroidered additional elements. 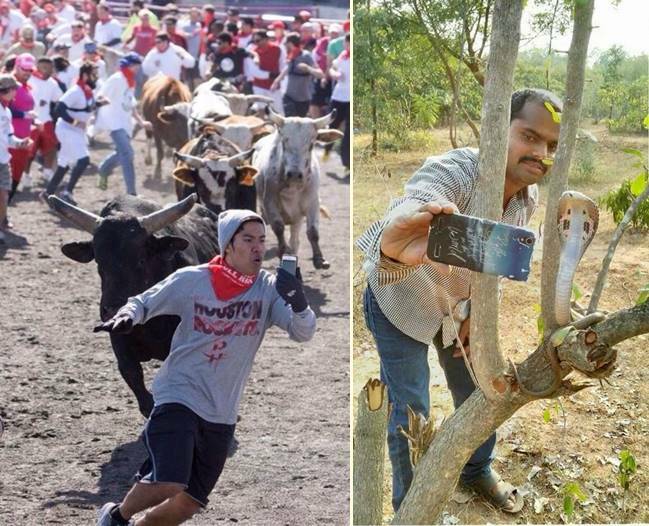 And is it worth after all you have seen to say that a talented person is talented in everything? 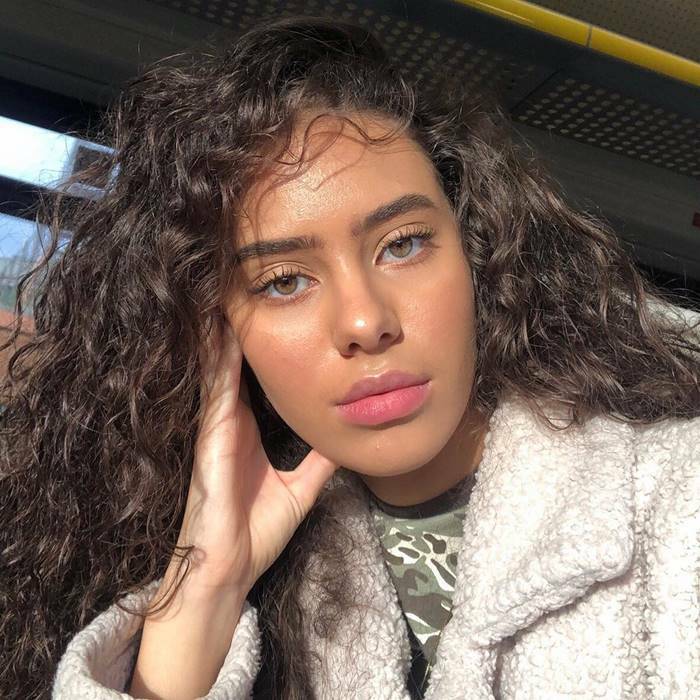 The creative work of the Faith has many admirers not only in social networks, but also outside the world wide web, and there are a lot of people who want to acquire such beauty. Agree that such an original picture can easily become a pleasant surprise for friends, relatives and friends, or an element of decor for an apartment, office or even some store with cute pleasant things.